As they say, horses are like potato chips: you can’t have just one. For all of us who may have started small at one point and have now lost count of just how many are out there in the pasture, here’s a tongue-in-cheek list. When you own one horse you have time to do things like groom, bathe, and exercise said horse everyday. When you own multiple horses you start to question yourself if they really need to be groomed off, because where the saddle sits is relatively clean. You could spend your time grooming or riding… grooming or riding…. riding. When you have one horse and he/she goes lame, you find out what the rest of the world does on their time off. Movies on the weekend? Shopping on Saturday mornings? Yuck: so….many… people. When you have multiple horses, you just go pick another to ride. Yep, one horse and you have a full set of new shoes every four to six weeks. Multiple horses and you’re begging your farrier to reuse the shoes one more time for a discount. I mean, it’s not like they’ve worn in two… yet. One horse and you can have a half-ton gas engine truck or SUV and little trailer. Multiple horses and most of your salary will be going towards your truck payment and large trailer payment. One horse and you can afford board. Multiple horses, you better have some horse property unless you’re Mrs. Money Bags. Want to dabble in all the disciplines with your sole horse? Your horse better be a jack of all trades. But if you have multiple horses you can have one for each discipline! 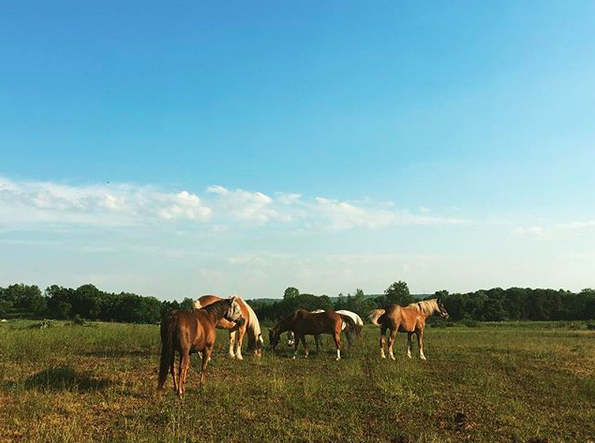 A jumper that panics on the trail, a trail horse with only one lead, a reiner petrified of cows, a team penning horse with no mouth, a dressage horse that can’t walk without jigging, and a pasture puff burning hay for good measure.